Light and the crystals it illuminates have become entities hanging in space. The metal structure disappears behind chains of irregular gems with different shapes and sizes, almost random in their juxtaposition. Here, the strict order of the chandelier is deconstructed and regenerated according to new asymmetrical and anarchic rules. 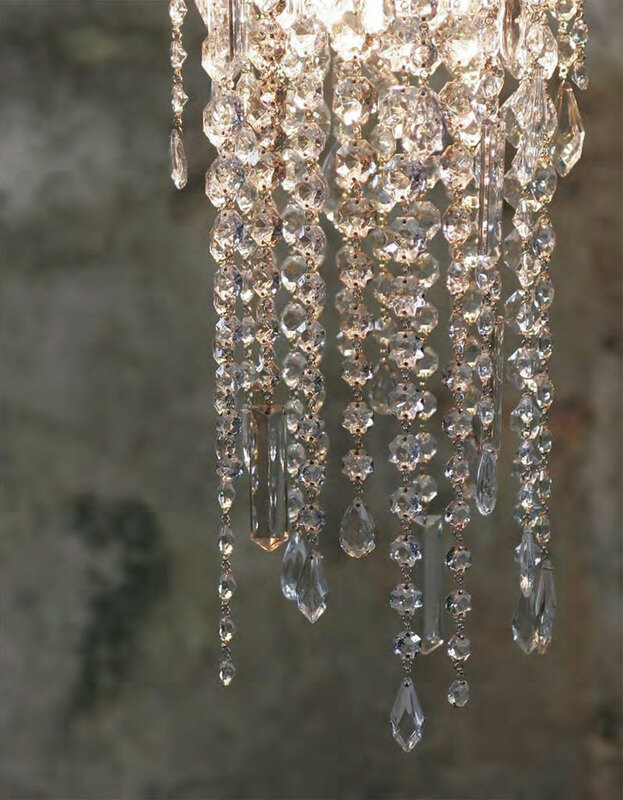 Crystal raindrops fall from an enormous explosive surface held by a barely perceptible metal structure, so thin it would appear to be unable to carry such a multitude of obsessively repeated strings of pendants. 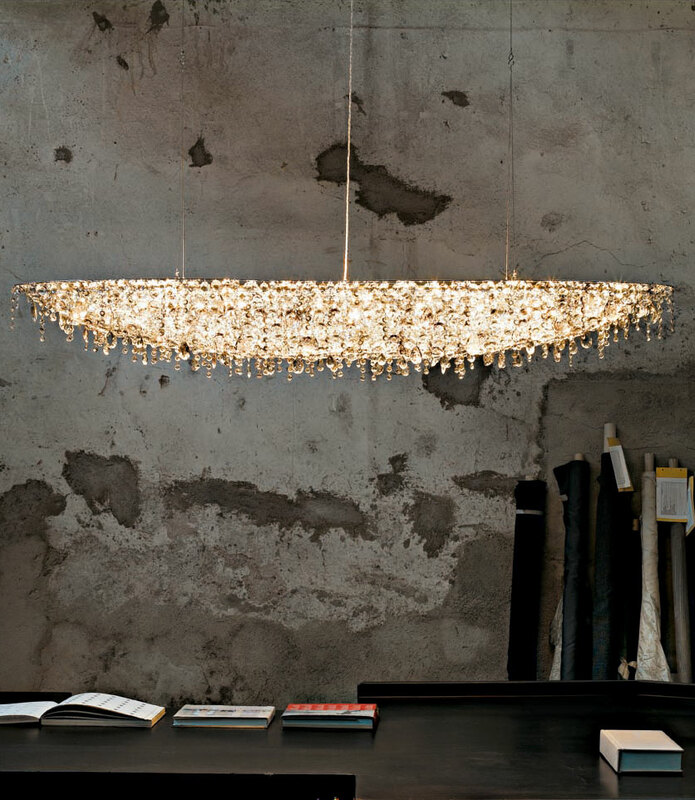 Space is swallowed up by the three-dimensionality of the chandelier as light reveals a fourth dimension. Elementary geometric shapes seem to defy the force of gravity. Suspended in mid-air, circular rings, concentric squares or rectangles trap a multitude of crystal drops in a net that is swollen with light. 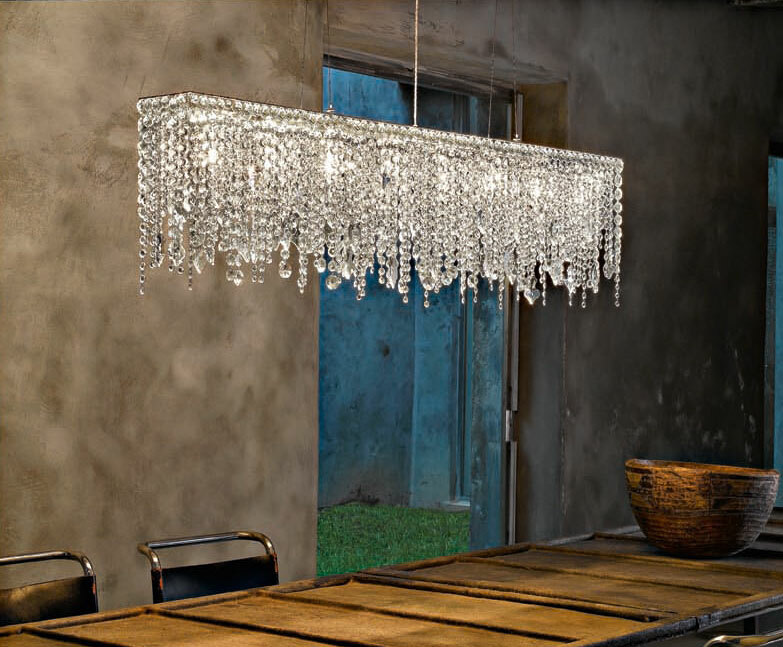 Vibrating reflections amplify the equilibrium between solid and void contained in the ambiguity of the space, or rather in the chandelier. 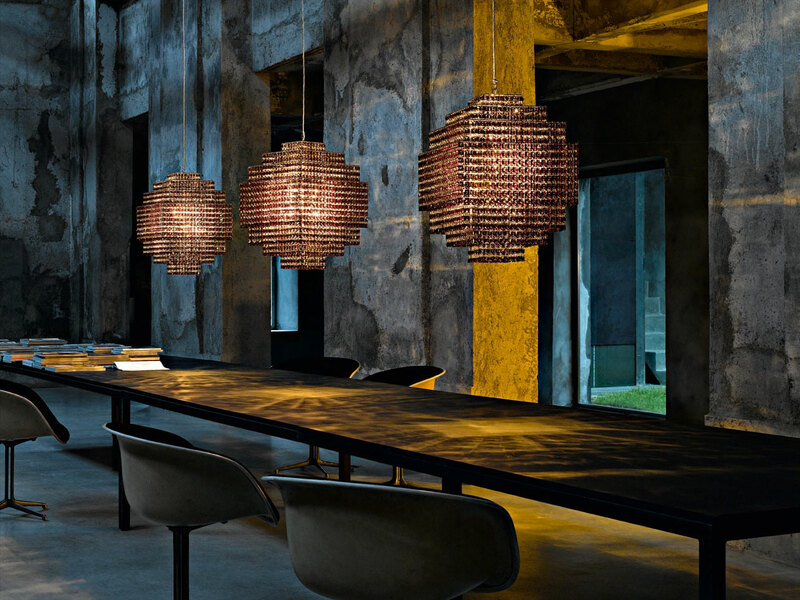 A mosaic of pendants is shaped into geometric proportions that defy the visual perception of their forms. A sphere might appear, unveiled by a layering of staggered cylinders, where the refraction of the crystals is renewed with each tier. In the meanwhile, light pulsates in the center and vibrates its way through each of the three thousand gems. 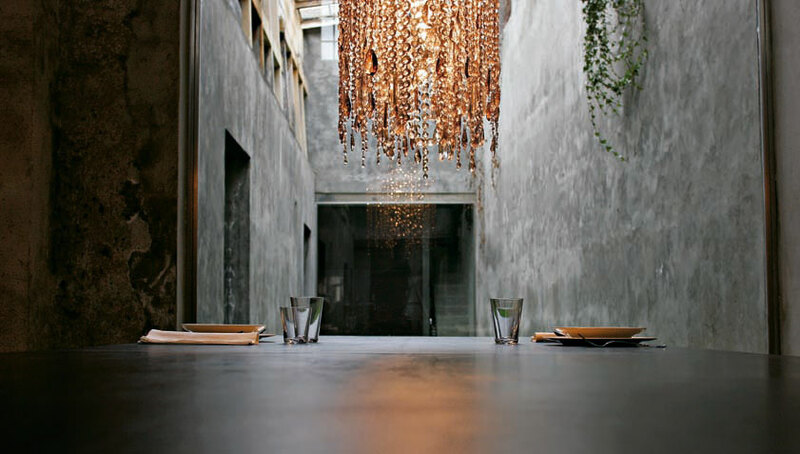 Light passes through a dematerializing mass cascading toward the ground drop by drop like a hanging limestone stalactite. Each band of crystals is layered below its predecessor, stratifying an increasingly transparent sheath down to the last pendant, seemingly frozen in the ultimate moment of skilful exploit, just in time to skim the floor. An invisible metal skeleton traces the line of a primordial geometric frame in space. From there, chains of crystals hang down delicately, reaching different heights – a feathery profile much different from the horizontal precision with which they begin their descent. 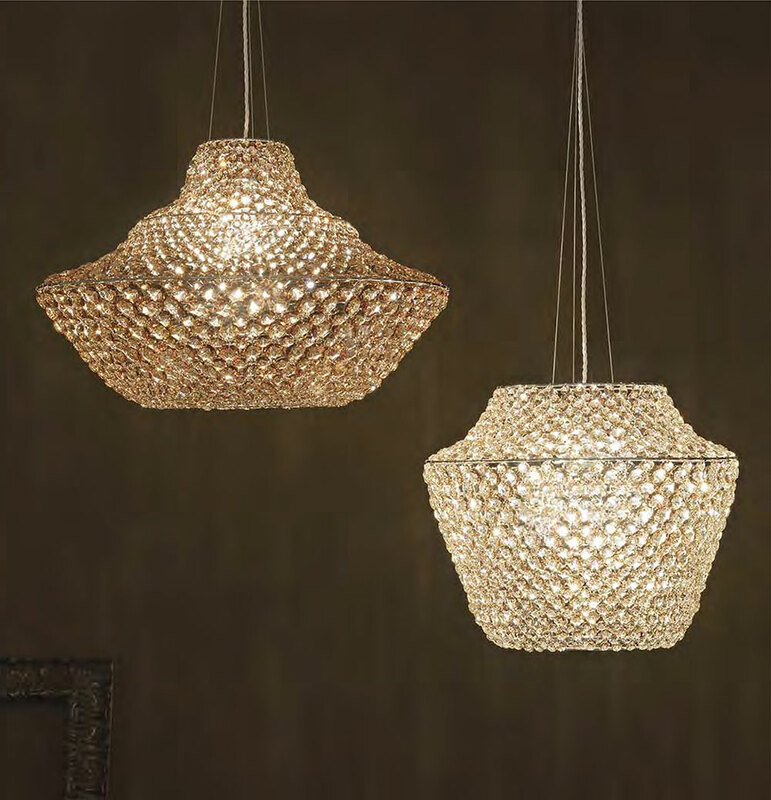 Streaming light and dripping pendants with a Bohemian cut. Crystals arranged in a continuous elastic surface, like a skin, cover a drum that has been geometrized to the bare essence of a metal skeleton. 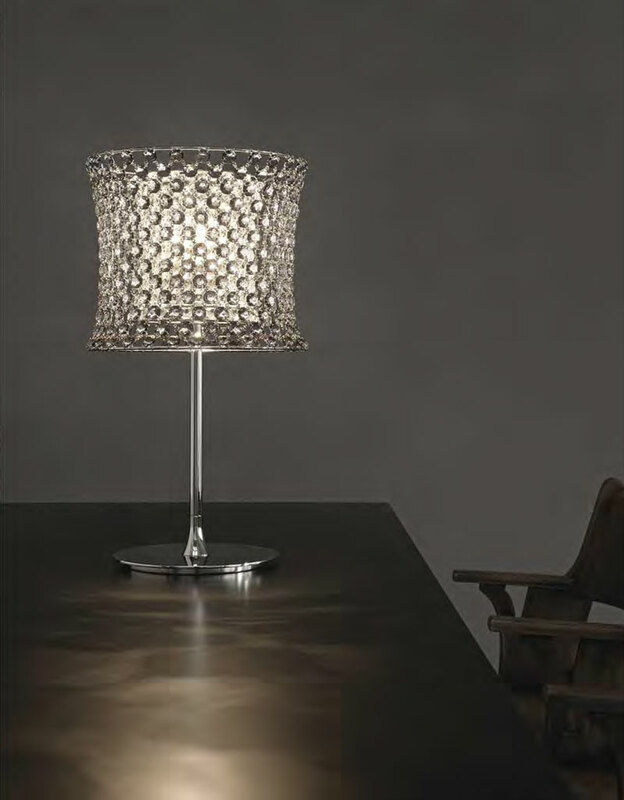 The arched profile reveals the secret, and the bejeweled mesh, so light as to not offer any resistance to the air itself, presents its tautness and symmetry as a touch of nature, as if waiting with bated breath. Like a fabric woven from double- curled hooks draped over a body of circular hoops, from the structure arises a form in precious equilibrium between gravity and levity. Crystals draw the curves, creating infinite tangents between heaven and earth, while the light passing through evokes moments of contact between worlds that are far apart, from East to West.